Big, Bright. Pure White Light. 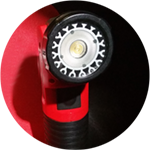 TommyGunn, GatlingGunn, TommyGunn Howitzer, and our custom conversion kits for Milwaukee Tool and Dewalt components each offer industry-leading LED technology, superior battery life, and name brand reliability. Innovative TommyGunn UV guns are now shipping – unmatched for cutting paint drying times. The ChromaLectrix family of innovative LED products meet the exacting paint matching standards of the collision repair industry. The ChromaLectrix family of innovative true-white light guns are designed to meet the exacting paint matching standards of the collision repair industry, while adding the ease and flexibility of a portable viewing system. Curing UV at the Speed of Light: TommyGunn UV Photon Torpedo dazzled industry insiders at SEMA 2017 in Las Vegas. Affordable, effective, and fits in a pocket, this handheld gun blasts UV dry in 60 seconds. 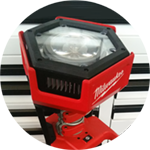 Our custom LED conversion kits for Milwaukee Tool and Dewalt components each offer industry-leading LED technology, superior battery life, and name brand reliability. Get Tomorrow's LED technology today. Let us show you how ChromaLectrix pro auto paint matching and drying systems can help your team do better work, every day. 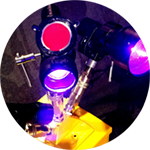 Call for a customized quote on TommyGunn products, LED conversion kits, or to schedule an onsite demo.